Think of the Soul 7 as the sum of everything Rossignol has learned about making All Mountain/Powder skis over the last five years—and that turns out to be a lot. The Soul 7 borrows bits and pieces from Rossingol and Dynastar skis past and present, combining and updating the best elements while also giving us new advances. 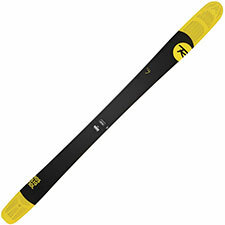 Officially debuting in Fall 2013, the Soul 7 easily looks to be one of the new high points in freeride ski design, retaining the S7's surfy-smeary character but modernizing it by adding All Mountain versatility. Among the advances is a significant effort to shed weight, including a new ultralight core plus a honeycombed tip and tail said to reduce overall ski weight by twenty percent. Like the Cham HM skis, the Soul 7 eschews a full-length metal layer, making for an active and lively ride on-trail and off. In my SIA on-snow notes I wrote that the Soul 7 is, "Fun all over the mountain, with excellent quickness, a noticeably low swing weight (thanks to that honeycomb tip and tail), surprising turn shape/skier style versatility, certainly credible on hard snow, easily active enough for the bumps, absolutely a triumph." In short, it was a home run for me. The dilemma with the Soul 7 thus becomes (1) that we have to wait until fall to get a pair and (2) whether or not to get more than one pair so that you can have both an Alpine and a touring setup in your gear closet. And don't think that touring appeal is accidental. Rossingol has not only given the Soul 7 a skin-compatible tail; they will be releasing a fitted skin for the Soul 7 as well. Liabilities? That tip, while not as pronounced as the S7's, is still quite spoony, raising worries about how the ski will handle chop—especially for lighter skiers. Additionally, as with all newest-of-the-new products, I do wonder how durable that honeycomb tip and tail will prove to be. Finally, given how light the Soul 7 is overall, heavier riders may—I say may—find themselves overpowering the ski.